Kal is really working hard here with his zippy chair from Nat Pagle that came with the hat after he caught how many gazillion fish for that damned hat. It was a surprise to me, didn’t know you got the chair complete with a beer in the cupholder – what more can a fellow ask for – it’s hard work fishing. This entry was posted in Kaldor Shadowmoon, Random Screenshots, Winds of War and tagged Fun Times, Kaldor, Kaldorei, More Adventures To Come, World of Warcraft. Bookmark the permalink. It’s an awesome chair and falling through the chair after a few beers won’t be anything “new” for Kal – Thanks for letting me know about it though, that would be embarrassing. 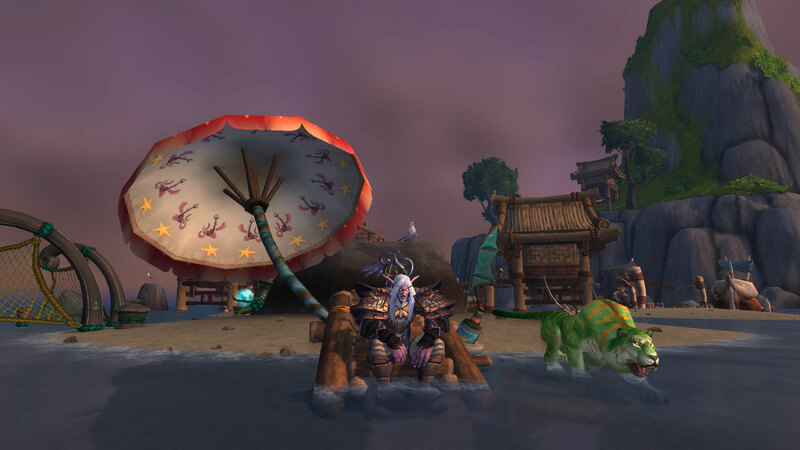 OOOO.. looks like I need to start working on the Anglers reputation.. cool chair! Yes, and don’t forget that not only do you get the cool hat that you can leave on when you run dungeons – you get this nifty chair. Haha, wonder how many times I’ll end up doing that?